Digiday - Six months ago, Breitbart was riding the wave of the election, plotting an international expansion to provide a platform to spread far-right, populist views in Europe. But today, Breitbart is facing traffic declines, advertiser blacklists, campaigns for marketers to steer clear and even a petition within Amazon for it to stop providing ad services. There were just 26 brands appearing on Breitbart in May, down from a high of 242 in March, according to MediaRadar, which tracks ads on websites. 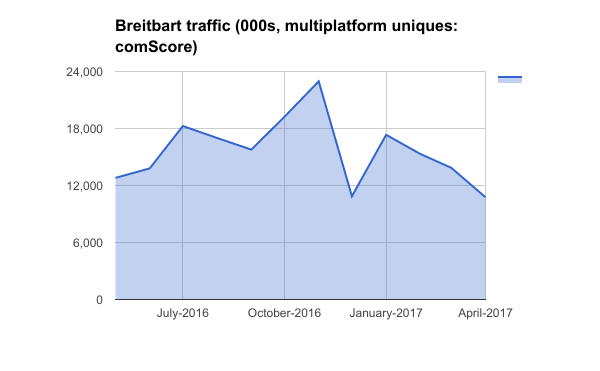 Many conservative sites, including Townhall, The Blaze and National Review, have also had declines, although those declines are much less pronounced than Breitbart, according to MediaRadar. The site’s decline also coincides with boycotts aimed at getting advertisers to stop running ads on the site. One, Sleeping Giants, a Twitter account started in November, has tracked the number of advertisers worldwide that have committed to stop advertising on Breitbart and its ilk. There were 2,200 on the list as of June 5, according to one of the account’s anonymous organizers. Ad tech companies including AppNexus and The Trade Desk have stopped sending ads to Breitbart. Breitbart has had problems of its own making, with its high-profile senior editor Milo Yiannopoulos resigning in February after making controversial statements about pedophilia. Yesterday, Breitbart parted ways with writer Katie McHugh after she tweeted that the U.K. wouldn’t have suffered terrorist attacks if there weren’t any Muslims in the country. Breitbart’s editor and site haven’t replied to requests for comment. More broadly, Breitbart has been caught up in the escalating scandal over fake news and “unsafe” content on platforms like YouTube and Facebook. Many marketers are now tightening brand-safety guidelines. But even if Breitbart’s advertising dries up completely, it still has a billionaire benefactor in Robert Mercer so it may stick around anyway — and a commerce business that hawks T-shirts, coffee mugs and beer koozies. From January to March, there were 20 categories of advertisers on Breitbart, many of them coming from media/entertainment and retail, according to MediaRadar. But by April, the advertisers had dwindled to mostly targeted, conservative brands that were buying programmatically, including American Patriot Daily and Cosmohurtskids.com. “What this means is that it’s now only able to get demand via Google Ad Exchange and Taboola, and it’s filled with classic direct-response advertising bought on a performance basis whose buyers don’t care about the same things brands do,” said Jonathan Mendez, CEO of Yieldbot, an ad-tech company that competes with Google by letting advertisers buy display ads by keywords. Ad watchdogs aren’t ready to declare victory just yet, though. There are still tech holdouts. Breitbart still has Taboola’s content recommendation engine and ads by Google appearing on its site. Amazon still advertises products through Breitbart, despite pressure from employees to cut its ties.